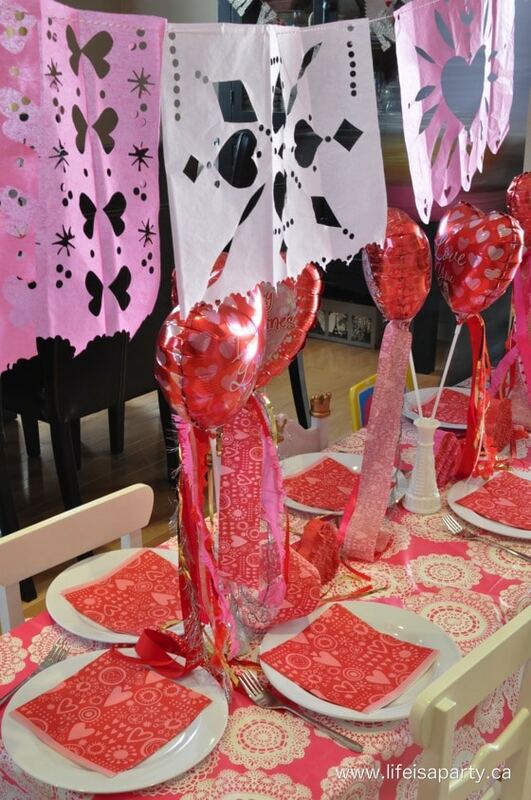 Valentine’s Day Fiesta: The perfect family Valentine’s Day party with decor ideas, menu, and games, including DIY Paper Picados and Mini Pinatas. 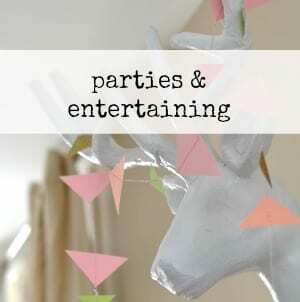 There is a point in your life, when your kids are old enough to be fun, and young enough to still want to hang out with you, where family parties are where it’s at. 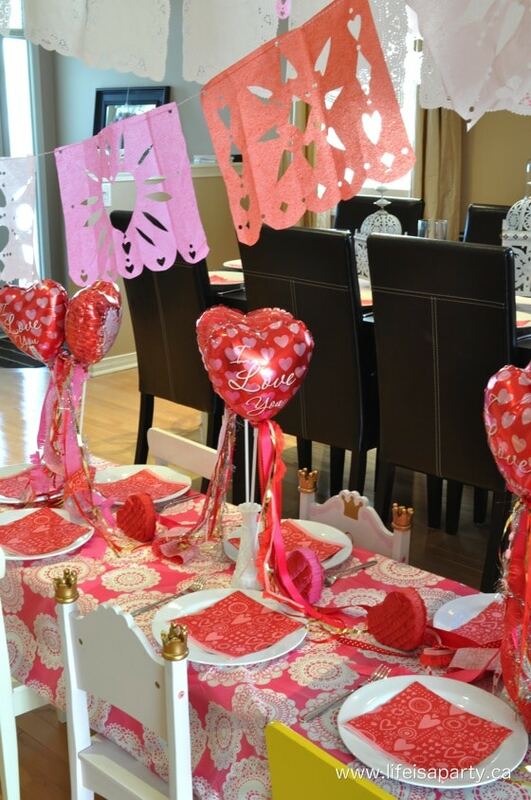 A romantic Valentine’s Day at a fancy restaurant is fun, and there’s nothing wrong with getting a sitter and having a night out, but when Valentine’s Day fell on a Saturday this year it seemed like the perfect occasion for a fun family friendly party. 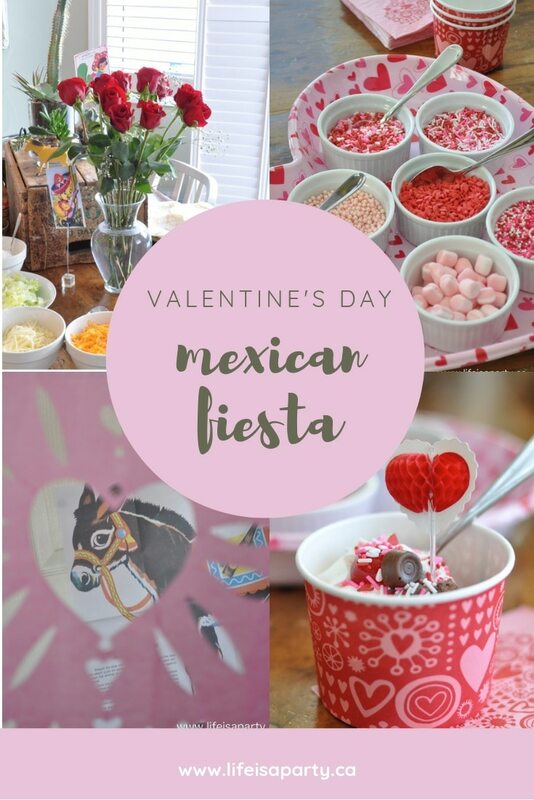 And since it’s feeling like such a long, and cold winter we thought a trip to Mexico for the night would be just the thing, so this year for we had a fun family friendly Valentine’s Day Fiesta! 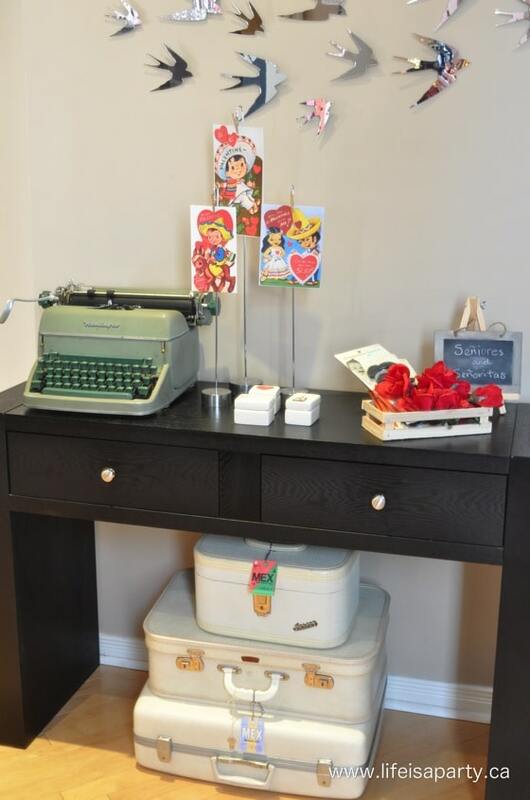 Guests were greeted at the front door with a few fun details. The airline tags for Mexico were found on-line and I attached them to my vintage suitcases. 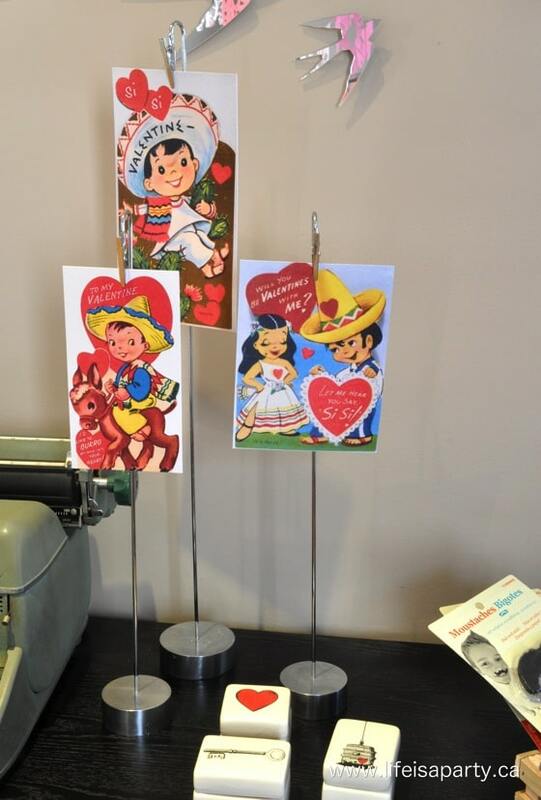 I also printed out a bunch of vintage Mexican Valentines, that I found on-line. They were so cute, and I displayed them all around the party. 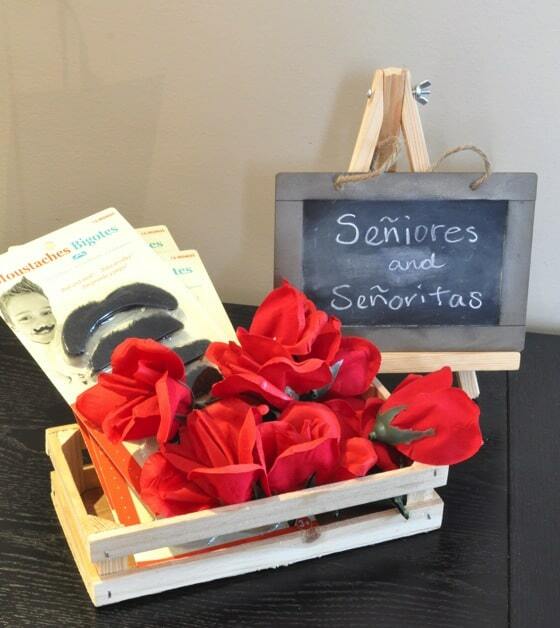 We also offered Seniores and Senoritas a fun stick-on mustache for the evening, or a flower for their hair -such a fun and in-expensive way to set the mood for the night. 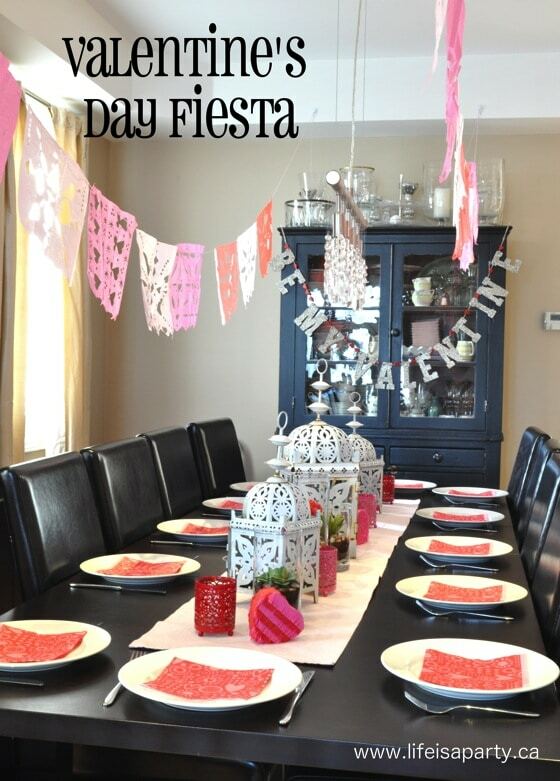 We set up the dining room for everyone to have dinner, and I had a lot of fun decorating it for a real fiesta feel. 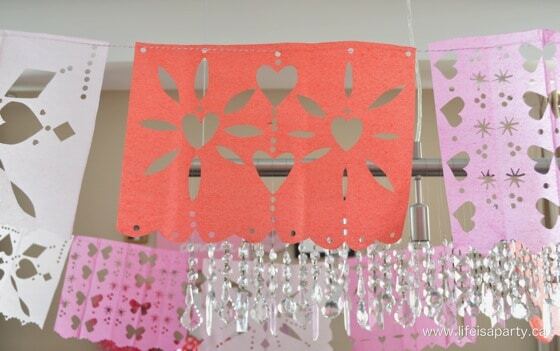 One of my favourite details of the party were the pretty Mexican paper flags, called papel picado. After looking on-line and in party stores for them, but in the end, ended up making a simple version of them myself. 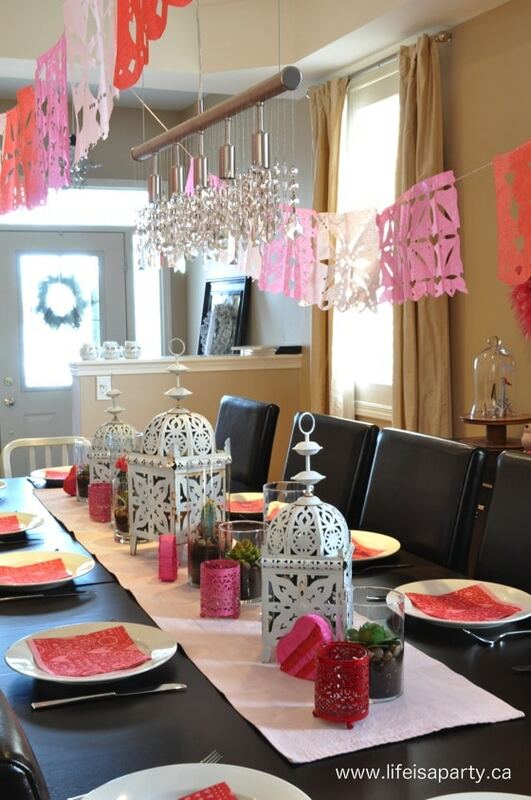 I used tissue paper, and cut out simple patterns in red, light pink, and dark pink. The patterns I came up with used a lot of hearts, diamonds, circles, and petal shapes. 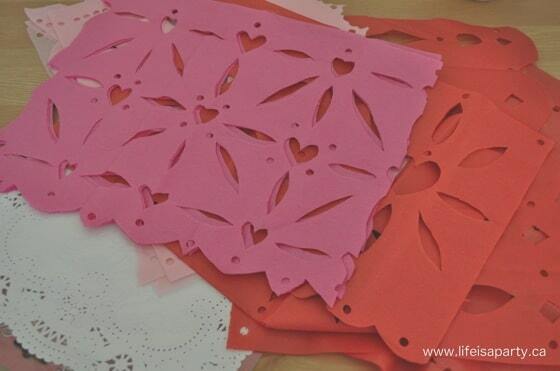 By folding the tissue paper, you’re able to create the patterns over the whole paper, and repeat the patterns. I just used trial and error to find ones that worked. 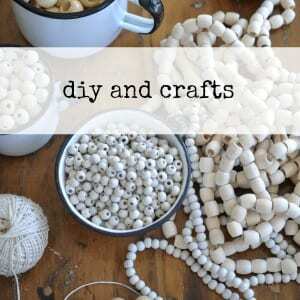 I also used a few paper punches, and a simple hole punch. 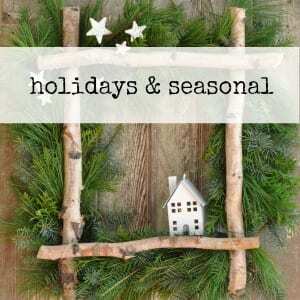 Part of their charm is in their imperfections and hand-made look. I made sure they all had some holes along the top, and hung them by threading them randomly onto string, and using sticky hooks to attach the strings to the ceiling. I also used some large rectangular white paper doilies, but in half, and thought they looked really really pretty too. 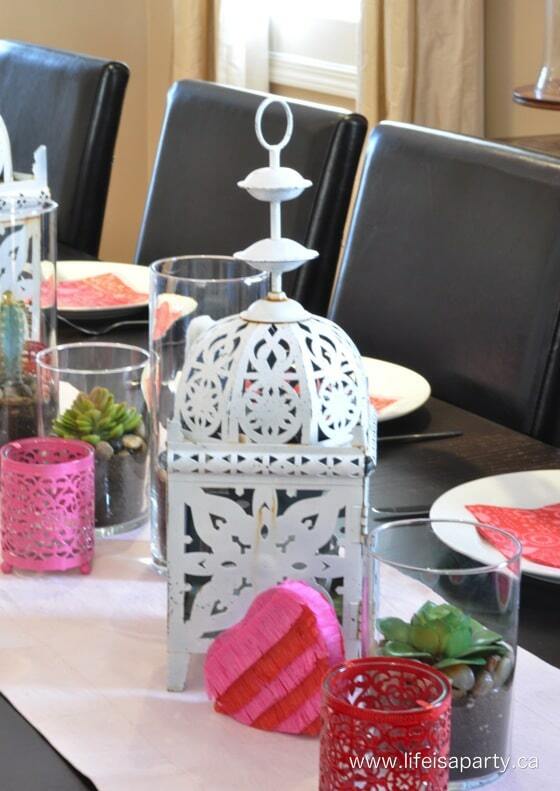 On the table I used my metal lanterns from the garden, I love the rustic metal for a Mexican feel. 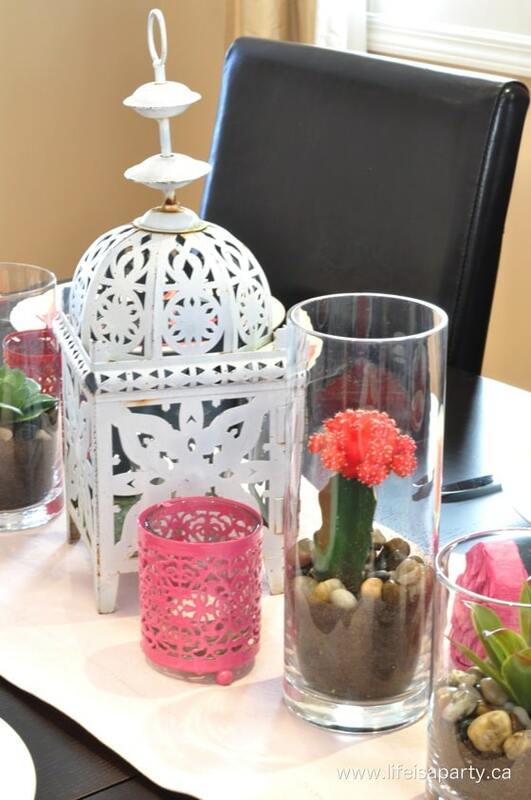 I also used some succulents and cactus in tall glass vases. The cauctus definitely added the fiesta feel! The smaller tea light holders are from the dollar store. They didn’t come in my party colours, so I had to break-out the old spray paint, despite the cold-cold winter temperatures. I was so pleased with how they turned out in bright pink and red, and added the bright hit of colour I needed to the table. 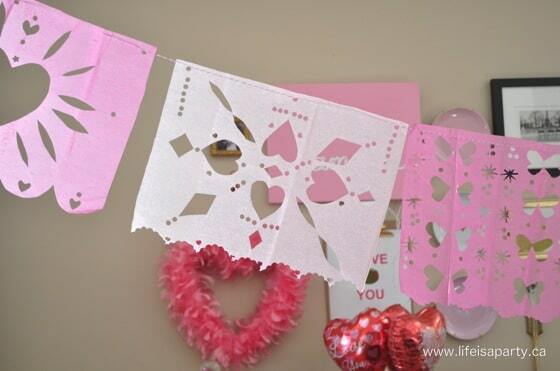 We also made some simple mini heart pinatas. I made them by cutting out two matching hearts from some thin cardboard cereal boxes, and some long straight pieces for the sides. 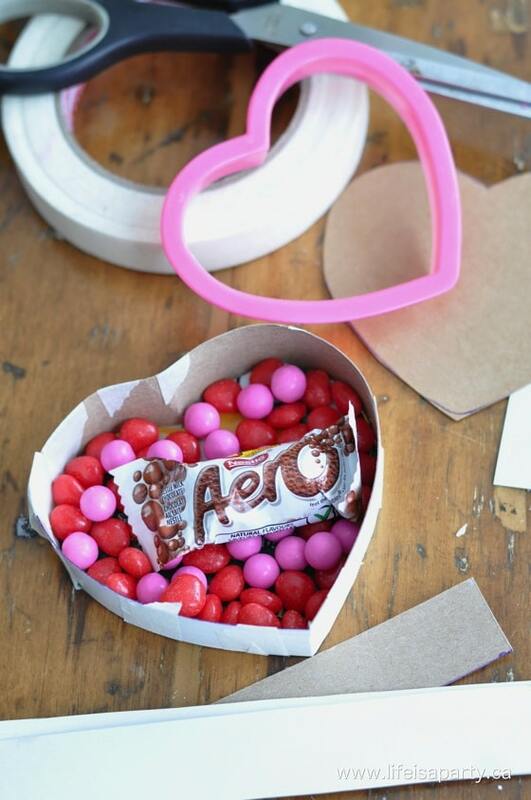 To make the boxes, I just used masking tape to tape the side pieces to one of the hearts. Then, I filled up the hearts with a few treats, and then taped the second heart on top. Once the boxes were made, I decorated them with streamers. 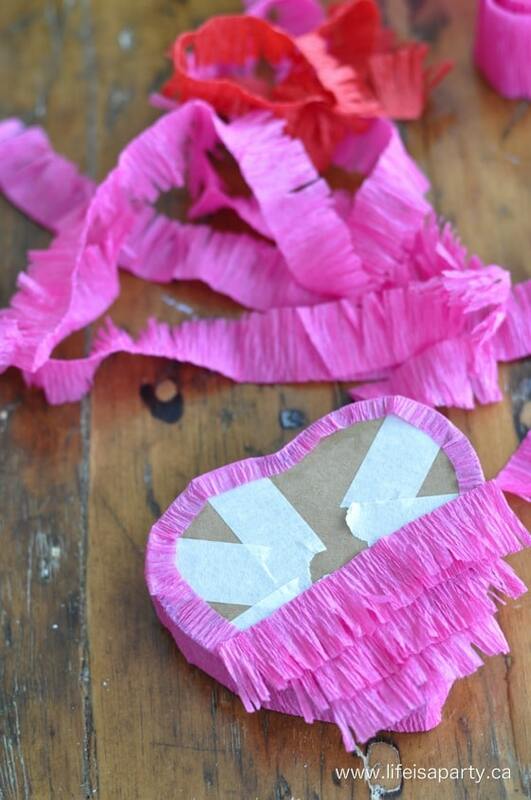 I wrapped the edge of the hearts first, then cut fringes into streamers folded in half, glued them on to the boxes, front and back, and finally trimmed around the outside. These were such a hit with the kids. They kept shaking them and asking if they could open them. 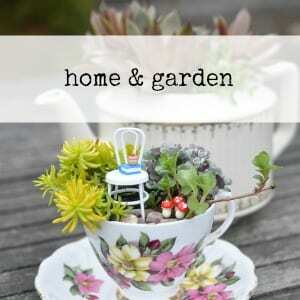 I sent one home with each of my little guests as a party favour, along with a special balloon from the kids table. Because we had 18 guests, we sat the kids at their own little table, right beside the grown ups. 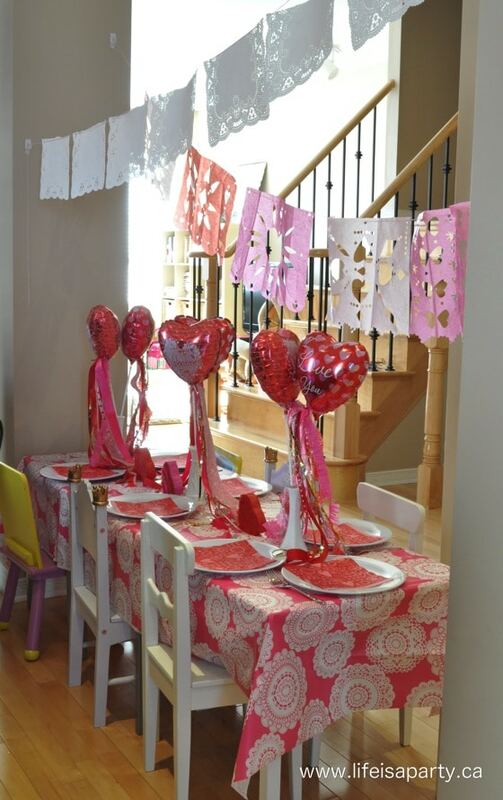 For their table, I gathered up all the little tables and chairs I could find, and used a pretty cloth, and more mini heart pinatas to decorate. 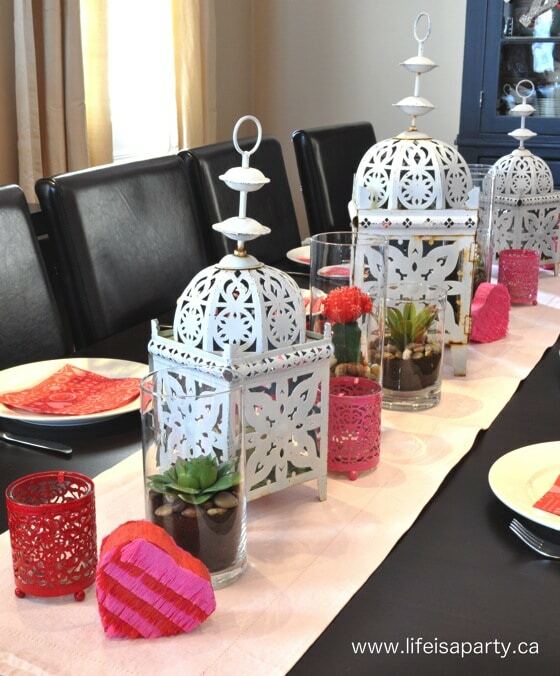 But my favourite detail of the kid’s table was the pretty centrepieces. I found the balloons at the dollar store. They aren’t helium, they’re just air filled on a stick, which helped with being able to get them early and not having to wait until the last-minute. 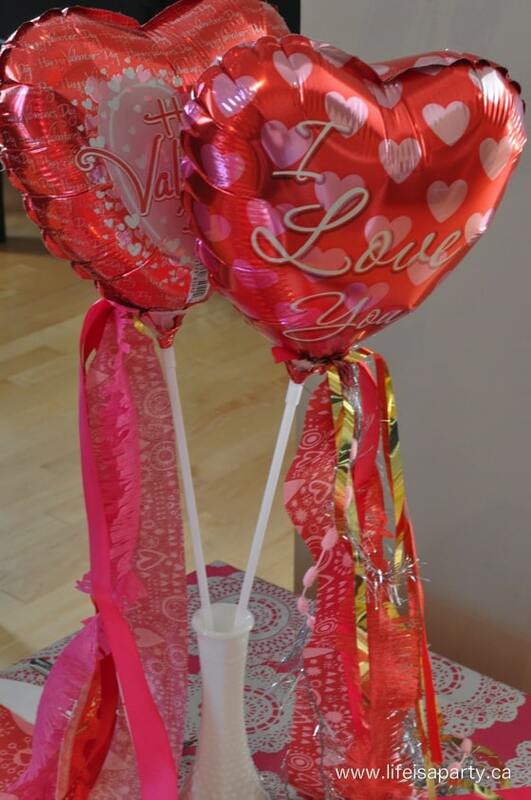 I made the balloons by adding streamers, ribbons, gold foil ribbon, and silver tinsel yarn. I cut them to random sizes and tucked them into the top of the balloon sticks. My girls loved them and said they looked like magical Valentine wands! One last fun detail, in the kitchen where the food was set up. 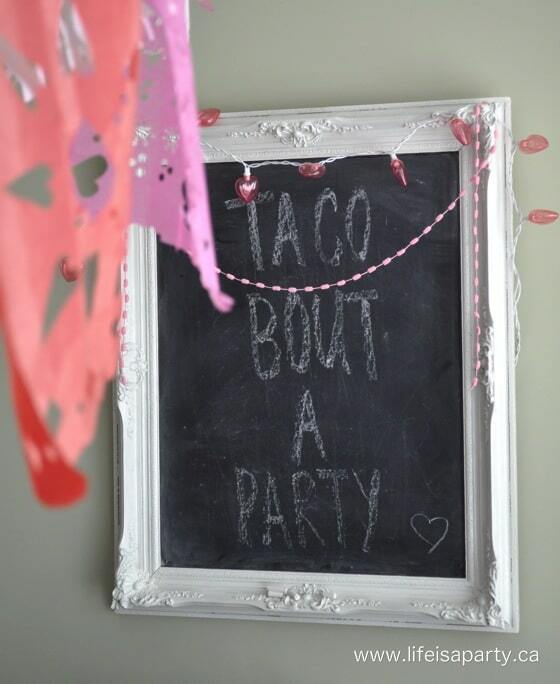 I usually have this chalkboard there anyway, so I added this fun message…”taco bout a party”. 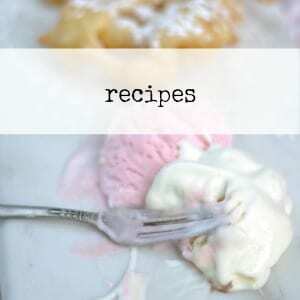 Want to see the amazing food, and fun little games we played -click here for that post. I hope your Valentine’s Day was as much fun as ours. 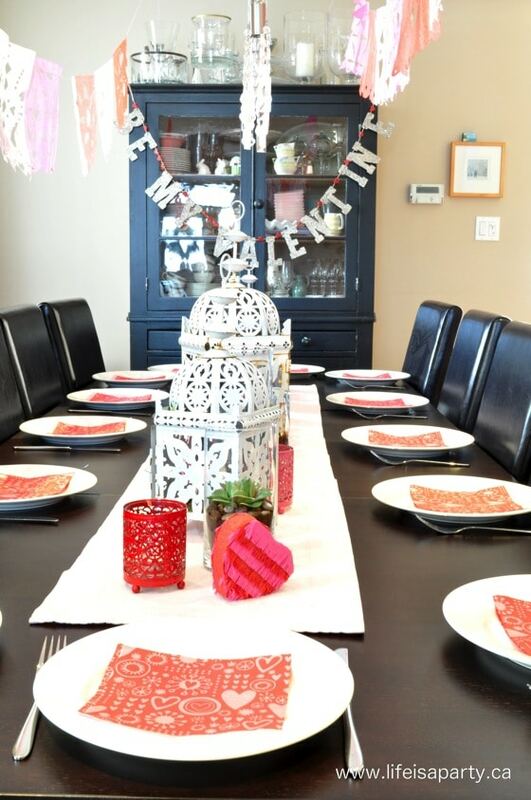 With a Valentine’s Day Fiesta, life really is a party!